Do you ever sit down to write someone a thoughtful note and freeze? I do, all the time. I want to get it just right and the words just don’t come. While I know that it’s better to say something appreciative than nothing, perfectionism gets in the way and I go mute. Definitely something to work on. I experience the same sense of trepidation when it comes to writing about someone’s work that I so admire. This recipe comes from a cookbook that I’ve been eagerly anticipating since I first heard it was in the works. It’s by one of my favorite food bloggers, Laura Wright of The First Mess. I’m always inspired by her honest writing, lush photography and brilliant recipes, which combine to create a powerful trifecta of skill and talent. 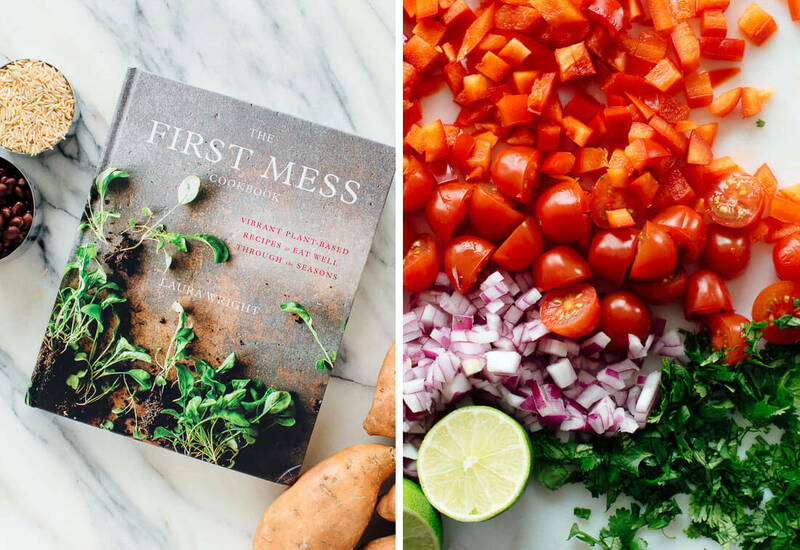 Her new cookbook, The First Mess Cookbook, is finally here and it’s everything I knew it would be—colorful, inspiring, and thoughtful. Her book offers over 125 plant-based recipes that offer creative uses for familiar whole-foods ingredients. 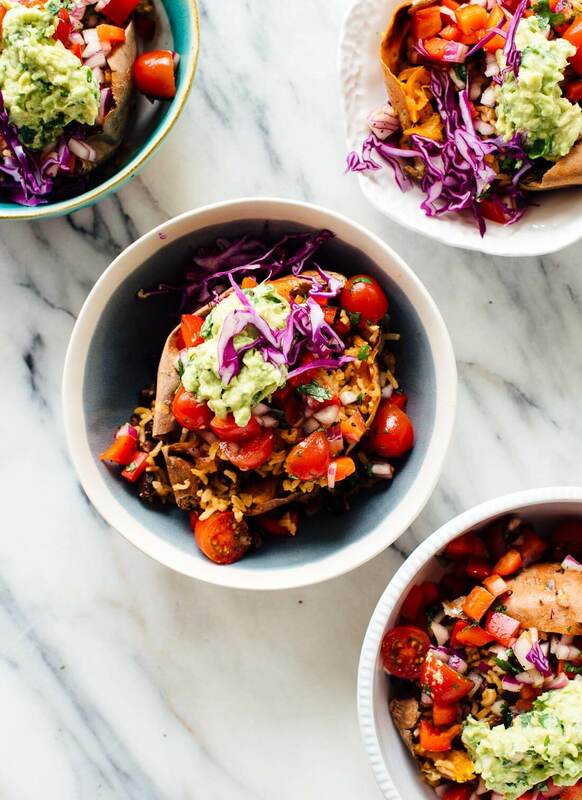 Now that I’ve crossed these amazing sweet potato burrito bowls off my list, I’m dying to try her mega clump granola, weeknight root vegetable dal, go-to kale salad with “master cleanse” dressing and fancy rice. What next?! 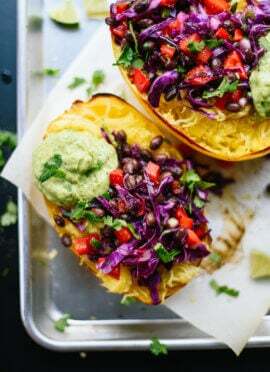 These burrito-stuffed sweet potatoes are everything that you might imagine on first glance—fresh, hearty and delicious. They’re conveniently vegan and gluten free, too. I was so hungry last night that I polished off two of these myself, so you might just want to go ahead and double the recipe. I suspect the leftovers would pack well for lunch, too. 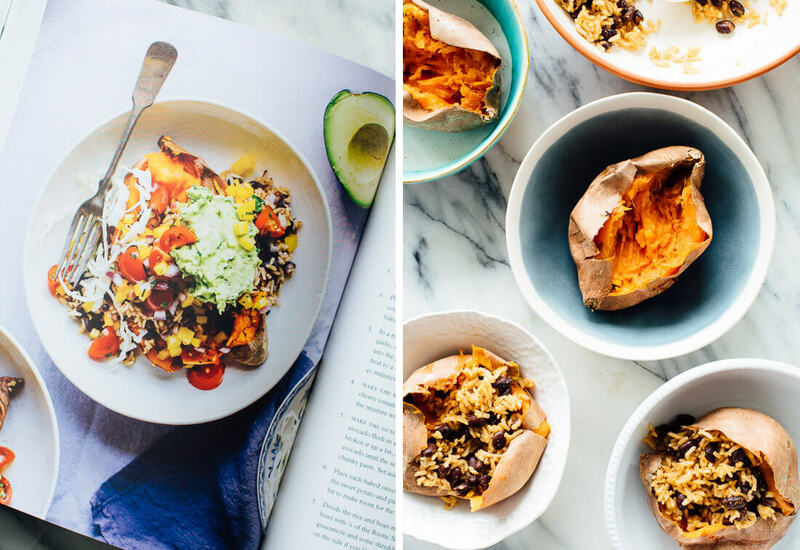 Fresh sweet potato burrito bowls from The First Mess Cookbook! 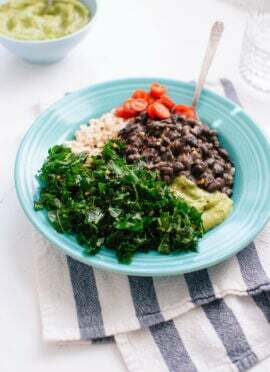 This is a fun, hearty dinner recipe that happens to be vegan and gluten free. Recipe yields 4 stuffed sweet potatoes, enough for 2 to 4 servings. Preheat the oven to 400 degrees Fahrenheit. Line a baking dish with parchment paper. Place the sweet potatoes in the baking dish, and prick each one a couple of times with a fork. Slide the sweet potatoes into the oven and bake until very tender, about 45 minutes (mine took 5 to 10 minutes extra since they were a little bigger than specified). In a medium saucepan, combine the basmati rice, black beans, cumin, garlic, olive oil, tomato paste and salt. Pour 1 ¼ cups water into the pot. Cover and bring to a boil over medium heat. Lower the heat to a simmer, and cook until all of the liquid is absorbed, about 40 minutes. Cover and set aside to keep the rice warm. Make the rustic salsa: In a medium bowl, combine the bell pepper, cherry tomatoes, red onions, lime juice, cilantro and olive oil. Season the mixture with salt and pepper, and toss to combine. Set aside. Make the guacamole: Peel the avocado and extract the pit. Place the avocado flesh in a medium bowl and mash with a fork. Once you’ve broken it up a bit, add the garlic, lime juice, cilantro and salt. Mash the avocado until the seasoning is evenly distributed and you have a chunky paste. Set aside. Place each baked sweet potato in a shallow bowl. Cut along the top of the sweet potato and pull back the skin. Spilt the sweet potatoes a little bit to make room for the fillings. Divide the rice and bean mixture among the sweet potatoes (spillover is fine!). Top each bowl with ¼th of the rustic salsa. Finish each plate with a dollop of the guacamole and some shredded cabbage on top. Serve with hot sauce on the side if you wish. That cover! I can’t wait till mine arrives. I understand your feelings about going “mute”. I used to not comment on blogs that I loved because I felt my words could not convey my admiration. Yes, her whole book is full of gorgeous photography and amazing recipes. I’m so happy you found my blog, Hanne! This recipe satisfies all my cravings! I’ve made it so many times and I always love the outcome! This sounds absolutely phenom! I love sweet potatoes (my husband is learning to love them) and I am sure this would be a hit at home. I’m sitting down to menu plan right now so this is definitely going on the calendar. Thanks for the book recommendation! I hope you try it, Ashley! You’ll love it. 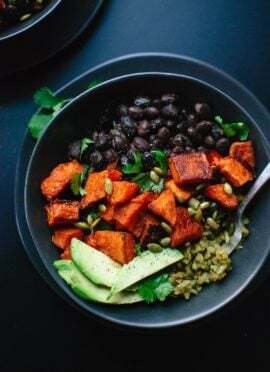 OMG I love sweet potatoes – I have to make this! I absolutely know what you mean – don’t we all enjoy getting a note that’s truly personal? I’ve been picking up a new hobby, handlettering, and I’ve decided to start sending my friends letters once I can make pretty cards with quotes and stuff! Handlettered notes sound so thoughtful and beautiful. What a great idea! It’s amazing, as are all of her recipes. Have fun with your new book!
! Added hot sauce and black olives. Could add roasted corn too now that I think of it. Thanks again! I love your recipes Thank You for some many wonderful ones!!! That rustic salsa though! 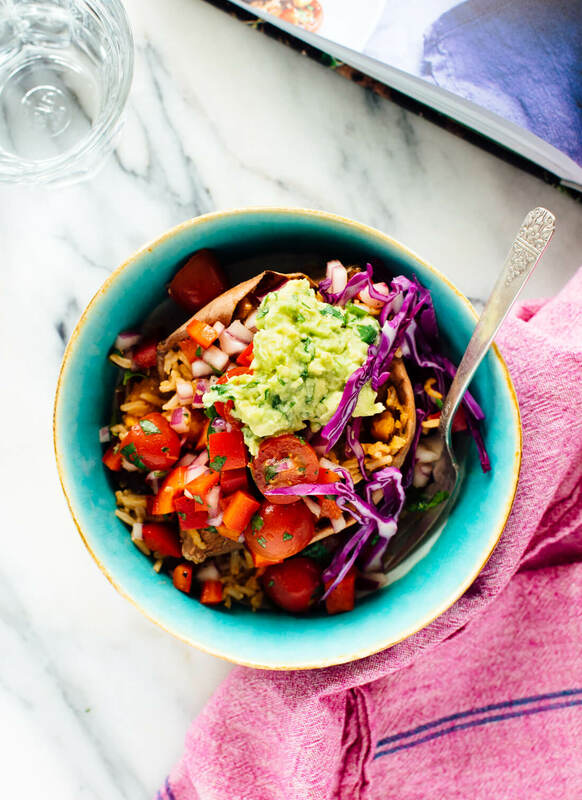 I love how Laura re-vamped the burrito bowl by stuffing it into a roasted sweet pot! Yes, so delicious and creative! I loved it. Yum! This looks like my kind of meal! Oh my goodness, this looks amazing! I will have to try this some time soon! The taco bowl looks delicious and FRESH! I’m so happy you found my blog, Nancy! Thanks for the kind comment. I’m excited for you to see the book! Everything I’ve seen from Laura’s new book confirms my opinion that it’s going to be killer. 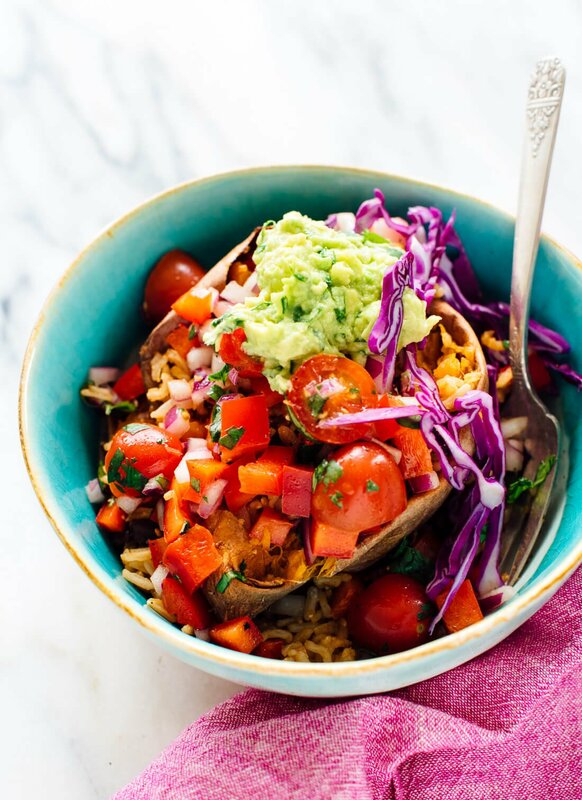 These sweet potato burrito bowls look brilliant- and delicious. I can’t wait to make these for dinner. That book is special, for sure, and this meal is amazing. I hope you love them! I made this last night and it was amazing. I added black olives and a little jalapeno. Thanks for another great dinner. Yum! That sounds great, Amanda. Happy you liked it! I read this post yesterday morning and had to try it. We followed the recipe, except we added Quorn bites (not vegan) sauteed in taco seasoning. Laid the sauteed Quorn on top of the sweet potato and followed with the rice, salsa and guacamole. It was fantastic! Thank Kate and Laura. Your version sounds delicious, Ron. Thanks for reading! I made this dish yesterday and it was delicious and so filling. I added jalapenos to the salsa ( I love spicy) and some Greek yogurt to the top for some creaminess. There was only two of us and I made 3 potatoes (my boyfriend likes to eat) and still had leftovers for lunch the next day. Thanks for this super easy dish! You’re welcome, Carolyn! Sounds delicious. Made this tonight for dinner because I had everything but avocados already on hand. Completely amazing. I’m so happy to have found your website and look forward to many more yummy meals. Thank you, Elizabeth! I can’t take credit for Lauren’s delicious recipes, but I hope you stick around and try some of mine! I really like cherry tomatoes and red onions so I clicked fast upon seeing the visual presentation lol plus the sweet potatoes that are really delicious and healthy. I can safely say this would gonna work on my taste buds! Soon I’m gonna be eating this with my family! I hope you try it, Saharah! I made the sweet potato burrito with my own improvisation…a bit lighter. No rice or guacamole. 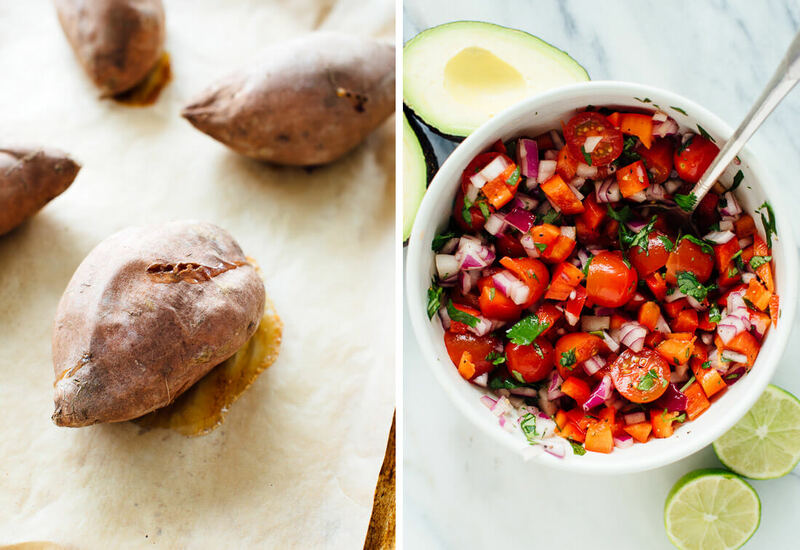 LOVE the richness and sweetness of the sweet potato with the mexican favorites. I did black beans seasoned with cumin and a feisty pico de gallo salsa with sour cream. Hit of Valentina hot sauce. These were delicious and my very picky toddler devoured them! (ok, he mainly devoured the sweet potato, but some of the other stuff on top made it in there as well) Great recipe! I just made this for dinner! Perfect single girl meal and I can’t wait to bring it to work for lunch tomorrow. my husband has colitis and can’t eat whole grains, so i’d have to use white basmati instead of brown. what kind of adjustments would i need to make to the recipe? Hi Dawn, I’m sorry for the slow response. I think you might cut back on the water a teeny bit, and cooking time will be reduced quite a bit with white. I’m just not sure by exactly how much so you might keep an eye on it. We tried the burrito-stuffed sweet potatoes three nights ago, and my family loved them. Tasty, well balanced nutritionally and texture-wise, appealing to the eye (esp. with the shredded purple cabbage)–a terrific find, and not too time-consuming or labor intensive for the cook (moi). I’m so happy this checked all your boxes, Elizabeth! I LOVE this recipe!!!! I’ve made it 4 times in the last 2 weeks and I still can’t get enough of it! I didn’t have guacamole, or the fixings for guacamole, on hand the first time I made it so I topped them with Greek yogurt instead which was also delicious. Amazing! That sounds like a great creamy topping for these potatoes. Thanks, Becky! Made this tonight – delicious. This is a keeper! (And since I’m allergic to bell peppers I substituted one large jalapeño, no seeds, and it tasted great, just in case anyone else has the same issue). Thanks, Kathryn! Jalapeño is a great substitute with these flavors. This was delicious Kate! Thanks again for a great recipe. The only changes I made were red beans for black and couscous for rice (b/c I was out of rice). It was much more filling that I expected as well. Thank you, Stephie!I’m so glad you’ve been enjoying my blog. I hope the next recipe is just as good! This recipe sounds delicious but why do you cook the already cooked black beans with the rice for 40 minutes. Do the beans become mush? Hi, Alliger! The beans turned out great for me, and I haven’t gotten any feedback from commenters that would indicate mushy black beans. I think you should try it! Made this twice now. Easy, filling and phenomenal!! Second time someone(?) had used avocado so we added some ready made coleslaw lurking in fridge. Still amazing! Have also cooked rice part as side for another meal. We are in uk…your fame spreading! Haha! I’m glad to hear the blog is making its way around the world, Christine! I stumbled across your blog whilst looking for vegan recipes. I recently decided to make a healthy positive change. I have to say I love your recipes and blog! With so much info out there it was refreshing to have something simple and clear! I can’t wait for my cookbook to arrive… Just ordered it! Thanks! So good! I made this for dinner last night and I used vegetable broth instrad of water. I have leftovers for lunch and can’t wait to dig in! I will definitely be making this again! Thanks for sharing, Elyshia! Leftovers are the best! I am a huge fan of your page and have been using your recipes pretty well every day for the past year! This recipe was outstanding! I didn’t change a thing, it also looked so beautiful on the plate! So great to hear, Chelsea! I’ve made this recipe multiple times and I love how quick and easy it comes together and how delicious it is! Plus, there are SO many ways you can mix it up – add spinach, throw an egg on it, etc etc. PS – The rustic salsa is incredible!